I have returned from what I can only describe as an epic weekend (Okay, I seem to say that after most shows I attend, but when it’s as high a standard and the experience was as amazing as it was, then it’s a fair way to describe it) and I’m on such a high from everything. The first night took place in Norwich’s Project Nightclub where Dann Read came out to thank everyone for turning up and ripped into whoever it was who had tried to sabotage the night (see the post on the original venue being pulled for more details) and mentioned that someone had rang BBC Suffolk claiming to be from the company and said that the night had been cancelled in the morning (thankfully a fan had rang EVE to check and EVE were able to ring BBC Suffolk themselves and tell people it was definitely on). This was echoed at the afterparty by a few of the girls who had much the same reaction (i.e. wondering why would anyone have a problem with women’s wrestling in the 21st century). Opening round match: Nikki Storm beat Sweet Saraya, Rhia O’Reilly and Amazon after April Davids, Jenny Sjödin and Blue Nikita interfered (Blue Nikita hit Saraya with a kendo stick to help Nikki Storm pin her). Saraya got hold of a mic. and started shooting on Dann Read asking what sort of promoting it was (I don’t know of many companies that actually acknowledge the promoters, so it was quite interesting to see this breaking of the fourth wall), Dann informed her that Blue Nikita is back because Jetta threatened to sue the company and Blue Nikita was the settlement. Opening round match: Erin Angel beat Pollyanna, Super Janey B and Sara Marie Taylor. 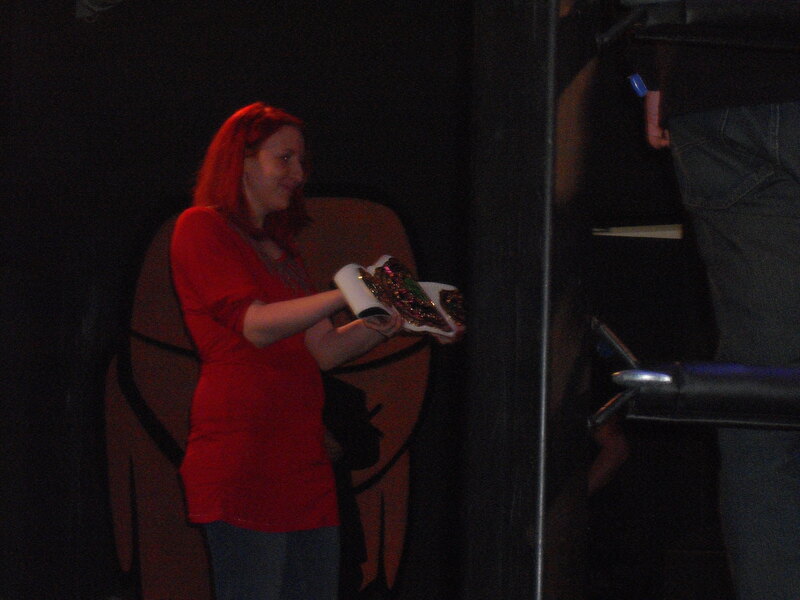 Pro Wrestling EVE v Ice Ribbon was then announced for October 8 and 9 in Doncaster, in conjunction with 1PW. Opening round match: Alpha Female beat Em Jay, Carmel Jacob and Kay Lee Ray. Opening round match: Jenny Sjodin beat Britani Knight and Melodi in what was a shock to most people. Blue Nikita was meant to be the 4th participant but Saraya came out before the match and they brawled to the back. Quarter final match: Nikki Storm beat Erin Angel with an AP Cross. Nikki threw the signs i’d brought with me, at me. Britani Knight won the Last Chance Battle Royal where all the previous match losers (including Erin Angel) took part. Jenny Sjodin came out straight after the match ended and attacked Britani. Quarter final match: Britani Knight beat Jenny Sjödin with the Knight Light (package DDT). All in all it was a very good night and I went to the afterparty where I got chatting with the Glamour Gym (Carmel Jacobs and Sara Marie Taylor who thanked me for buying one of the posters EVE have produced), Nikki Storm and Jenny Sjödin (who it was great to talk to about what it was like to be a female wrestler from a different country). Nikki was brilliant and went ‘oh s###’ when I mentioned it was my signs she’d gone for, but I thanked her (because I love it when heels do that) and said if she wanted to rip one of them up the following night for some cheap heel heat I was quite happy for her to do so. April Davids, Jenny Sjödin & Shanna beat Rhia O’Reilly, Erin Angel and Blue Nikita (who was in a tweener role). Originally this was meant to be Blue Nikita vs. Erin Angel but Jetta and the European Empire came out and Jetta said that Blue Nikita had been brought back to take out the Knights, but she hadn’t delivered and was therefore out of the European Empire. Rhia O’Reilly then came out, still furious at the European Empire for costing her the previous night. Jetta ended up explaining that as there were three of them (Angel, Nikita & O’Reilly) and three of her Empire not in tournament action (Shanna, Davids & Sjodin), so they should have a trios match. Super Janey B beat Pollyanna with a top rope crossbody, finally getting her first victory in EVE, then challenged either Carmel Jacob or Sara Marie Taylor for a match later. Destiny beat Sweet Saraya with an avalanche and big splash. Destiny got some heel heat when she came in and basically she said she wasn’t going to wrestle whilst the crowd was making noise so I started the ‘Na Na Na Na, Goodbye’ chant that went round the crowd. The Glamour Gym (Sara Marie Taylor & Carmel Jacob) beat Kay Lee Ray and Liberty after they had both received DDTs at the same time. Semi final: Britani Knight beat Jetta with a Knight Light. I was the only person cheering for Jetta, as per usual Jetta tried to get Britani to join the European Empire, but after slapping her in order to make her ‘see sense’ Britani went on the offensive. This was pretty much your typical Jetta match (a lot of talking/mat wrestling and minimal bumping). Semi final: Nikki Storm beat Alpha Female with interference from April Davids, Jenny Sjödin, Shanna, Carmel Jacob and Sara Marie Taylor. Nikki ripped up one of my signs before the match (as I had requested, which made my night). This was looking like it was going to be over quickly for Nikki, but then the European Empire came out after Alpha had hit her with the Omega Slam, and then got attacked from behind by the Glamour Gym. Jenny Sjödin & April Davids beat Destiny & Amazon in a tornado tag match. I was wondering if they would allow this match to actually take place, considering it had got thrown out on the previous show, but it ended up being a pretty decent brawling contest. All four carried on brawling afterwards towards the backstage area. Shanna beat Sweet Saraya with a top rope crossbody. This was an entertaining match and both women seemed to be at the top of their game (although Shanna was legitimately injured only a few months ago it wasn’t telling). Erin Angel beat Blue Nikita with a moonsault. This was a bit of a fun match, however I have no idea what they are going to do with Blue Nikita now she is no longer a part of the European Empire, but then isn’t over as a face, possibly EVE will go for a Erin Angel/Blue Nikita feud which could be alright. Rhia O’Reilly beat Em Jay with a crucifix. This was a pretty solid match and Em Jay was working well as the heel (I was talking to her after the show and found out she’s usually a face, but is happy to work as a heel). Rhia showed why SHIMMER decided to take her over to star on their SPARKLE shows last month. Britani Knight beat Nikki Storm with a Knight Light from the second rope to win the Pro Wrestling EVE Championship. Nikki came out with Jetta and they were very mouthy towards the crowd, with Jetta having to ‘calm’ Nikki down. Inevitably Jetta got involved but Saraya came out and ran Jetta back to the backstage area, and even after the 12 matches the crowd was giving a good response to the matches. When Britani got her hand raised the face side of the locker room came out to congratulate her. This was a great end to the championship tournament and Britani deserves the championship (along with the plaudits that go along with it). 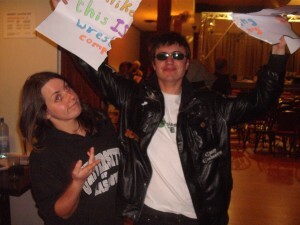 After the show had ended I hung round to meet/get autographs with all the wrestlers and got to thank Nikki for ripping up my sign. It was also great to chat to Saraya about SHIMMER and I am now looking forwards to getting the latest DVD’s as the Knights basically caused a riot with the crowd (SIDE NOTE: seemingly Saraya has a death wish, as she is going to be going to one of the states where guns are allowed with the same reaction as she had last month). It was also great getting to chat to Jetta again, as well as various other wrestlers and fans who had travelled from all over (well Germany, Scotland and Ireland) and I got a hug off both of the Glamour Gym. As always, you can buy Pro Wrestling: EVE DVDs, tickets, and posters at EVEWrestling.com, follow and interact with them on Twitter (at @ProWrestlingEVE), Facebook (at facebook.com/EVEwrestling) and YouTube (at YouTube.com/user/ProWrestlingEVE).